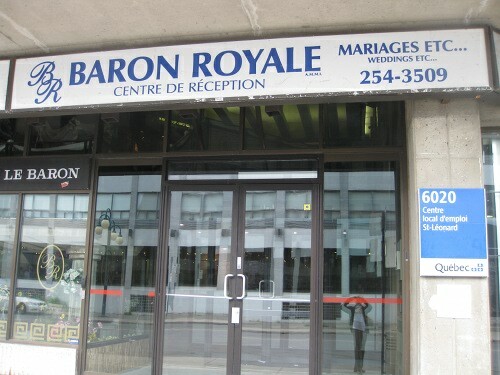 You can find Le Baron Royal in the complex le Baron in St-Leonard out in the East end. The entrance can is often confused with that of an office building lobby. You need to take the stairs to go up one floor and get to the real lobby and once there, you will need to turn to your right and enter the dining area. You can also access this by the elevators which makes the place fully wheelchair accessible (washrooms as well). The dining area has a large capacity and can work nicely if you have a big event. As I mentioned before, reservations are key especially if you are a large group. 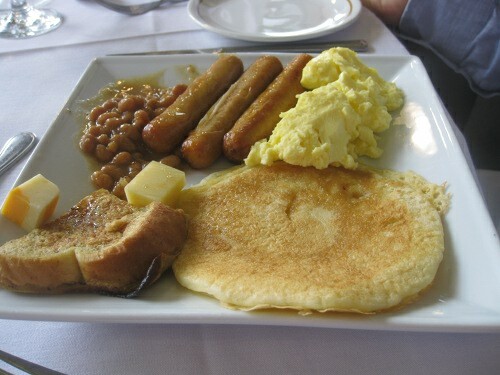 Now, in most cases with all the food available at the buffet you can put together a decent brunch. However, this is not the case at Le Baron Royal. Brunch is supposed to be a combination of breakfast and lunch and this was pretty much almost all lunch. There was a serious lack of quality breakfast items, that’s not to say there were none but they were lacking. There were some crepes, French toast, bacon, sausage, beans and scrambled eggs and that’s pretty much it. 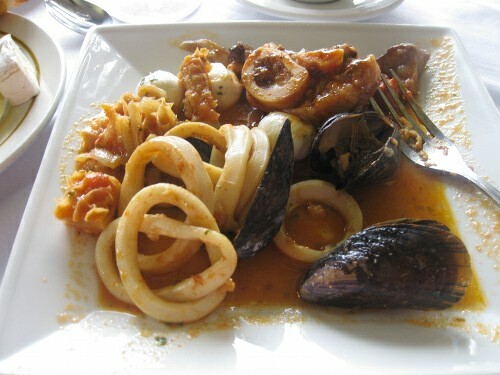 The rest was all lunch food, like meat fish, fruits, vegetables and cheeses. To call this a brunch with such meager selection of choice is so wrong and to make things worse once I tasted it, I went from sad to disgusted and I have just started complaining. All the breakfast food was in chafing dishes and some were not really warm, did not look that fresh, or appetizing. They even put some fruit on ugly plastic trays and I saw someone refill the orange punch fountain with a big white bucket that although may have been clean on the inside, the outside did not inspire confidence (needless to say I skipped that station). I also saw patrons drop serving tongs on the floor and then pick them up and put them back in the food. I mean, come on, that touched the floor and you put it back in the food?? (I skipped that spot as well). I saw cut fruit dropped and put back with the rest of the fruit. I also saw cut fruit with grocery labels on them on more than one instance. I can understand this happening once since there is such as thing as human error, but making the same error multiple times on something that should come off once its washed does not instill confidence. Ok, now that I have complained on presentation, let’s get to the food. This is the truly important part considering that the rather large paragraphs before this paints a grim picture already. I used my standard buffet approach with doing a breakfast food sweep followed by a meat and fish plate then topping it off at the end with a sweet plate. By doing this, I find it covers most of the options but also ensures a full stomach. 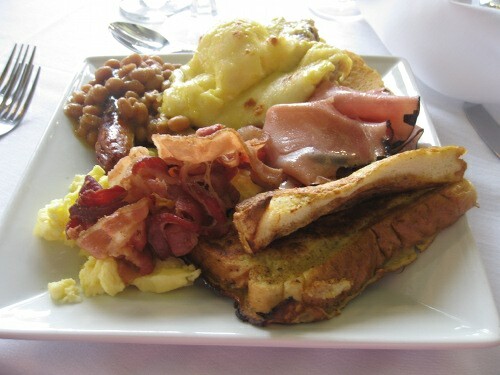 One of my two plates had French toast, eggs Benedict, scrambled eggs, crepes, sausage, bacon and beans. The French toast was very disappointing; the taste was lacking, the slices were incredibly thin, cold, and it lacked the eggyness that I so often talk about in my other reviews. The bacon was mediocre, although the sausage was good, and the beans were good (but its hard to screw that up, so not impressed yet). The crepes were boring and tasteless, and the eggs Benedict were… Well here’s the thing, I really love Eggs Benedict, it’s my favourite dish and what they did to it is a crime and I am almost crying as I am writing this. They ruined the eggs Benedict with hollandaise sauce so thick it was almost lumpy and the taste was disgusting, even the eggs weren’t properly done and it was on the cold end of room temperature. Lastly was the fruit, cheese and croissant plate. My croissant was not warm or buttery; the cheese selection was varied and good; the fruit was bland and tasteless, I should note that I did not eat the fruit that had been dropped or had stickers on it. This plate was an uninspiring plate to finish up and an uninspiring meal overall. In fact, the only thing this meal did was make me swear to never go back here again. I have been punishing my body for years by eating in excess, drinking too much or running long distances on injured legs, but this made me realize that I can say no – kind of like a bad relationship. Enough is enough! I will never go back to Baron Royal for brunch and put myself through that kind of abuse and punishment again. I never had any problems with the service as it has always been good, although, since it is a buffet, the interaction is limited since I only get people who want to sell wine or the guys who take my plates. One year I had put some sea food on the same plate as my eggs and the person at the station mentioned how it was wrong to do that. I laughed and told him that it ended up in the same place. I did not like that but it was a couple years ago and the service was decent the other times I went. You can make a meal here if you are vegetarian in that they have lots of fruits and vegetable dishes as well as non-meat items. 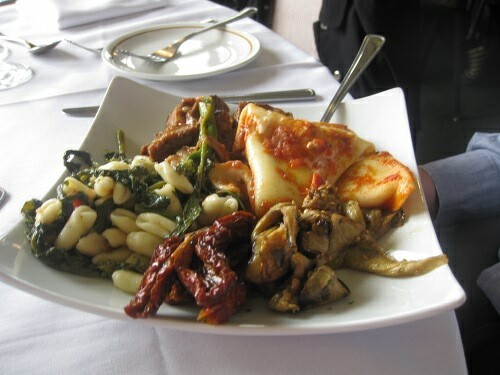 Since the items are in a buffet style, you don’t get meat mixed in with a dish. In fact, there is a good enough amount of fruits and vegetables to make it work even for vegans. If you missed the food section please go back and read it. If you did, then it will not come as a surprise why I would avoid this place. Never has brunch been so poorly treated and they pretty much missed out on the brunch aspect of it anyway – it was basically lunch. Even if it was free (which it isn’t), I would not go or want any friend, family or even enemy to go there. The lunch is decent but the breakfast component was horrible. This is the worse place I have ever been to for brunch. Now, if you excuse me I’m going to take a shower because after writing all this and reliving this painful memory, I feel dirty. Good Lord. All I can say is, “Wow.” I hope your reading audience appreciates the public service you’ve done by going to this establishment so the rest of us won’t ever have to make the same mistake. I get a bit melancholic when I think about all the amazing meals I could get for $37: amazing meals that would totally fill you up. Oh, the humanity. WE ARE NO.1 IN TOWN. THINGS HAVE CHANGE SINCE YOU CAME. COME AND TRY OUR NEW AND IMPROVED BRUNCH. i don’t understand, if the food was so horrible, why did you say you went there for birthdays, anniversaries, and Mother’s day. I went there for supper a few months ago. My son’s hockey party was held there. it was buffet style. the food was pretty good. I went there because i had no choice, on account of family events. I would love to boycott it fully although it would involve me not being there for family outings, so I go anyways. Although I can’t speak for the dinner service, I can tell you this is the worse Brunch buffet I have ever been to and quite likely the worse brunch in general (and I have been to 200 plus brunches to date). In fact I held back on this review there are other items and occurrences I did not publish, because I felt it was excessive. Considering i paid 37$ I could of gone to any other Brunch Buffet and had a more enjoyable experience. this no.1 brunch in town is only 38.50 per adult ,you have over 45 selections to choose from, this includes service and taxes and also soft drinks , coffee, juice, capuccino, expresso. free inside parking and for groups over 30 a private hall to party from 11 am to 6 pm . kids under 10 pay half price and under 5 free. Yo frank v how much did the mingione owner pay you to write good reviews about this dump! The food is gross! at your restaurant for dinner & what’re your prices?